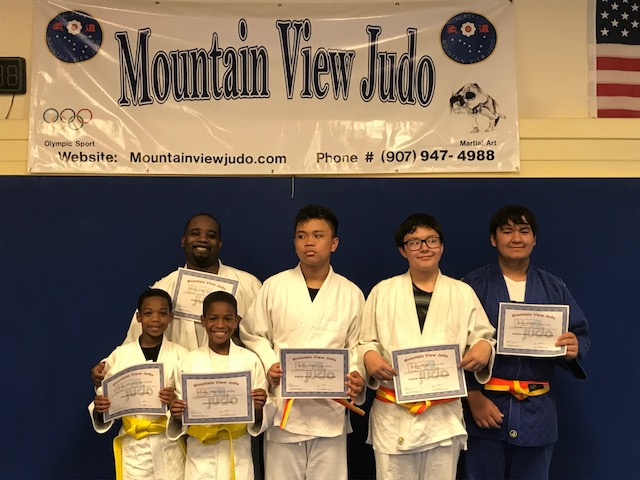 Mountain View Judo Club raises $500 to help support Dorian Mellon and the South High School Wrestling. 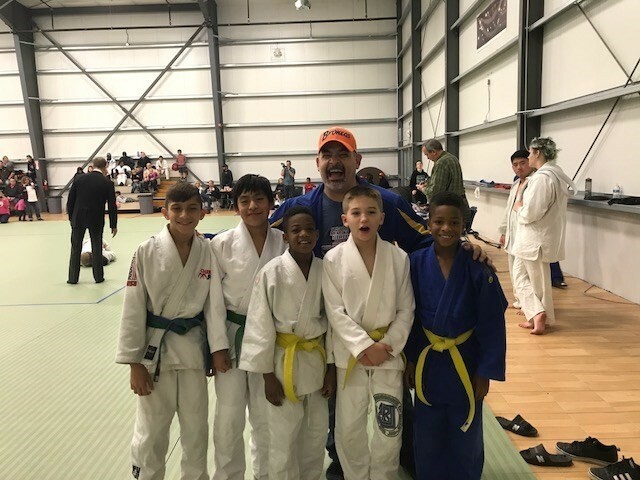 MVJ hosted the Alaska Judo Inc Fall Promotional Mat test over the weekend. 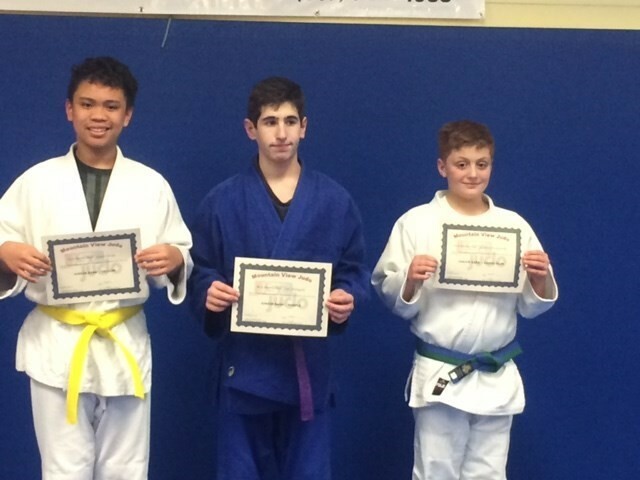 A big congrats to Steven Floerchinger, Neil Arneson, and our very own MacKenzie Harvey for passing their Shodan test. 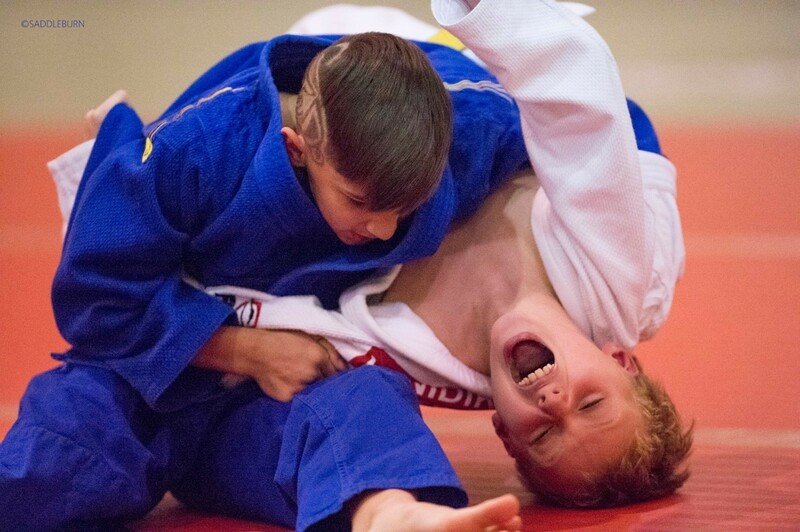 MVJ send 12 Judoka to local Newa Waza Creepy Crawly tournament. Click here for results and a couple more photos. 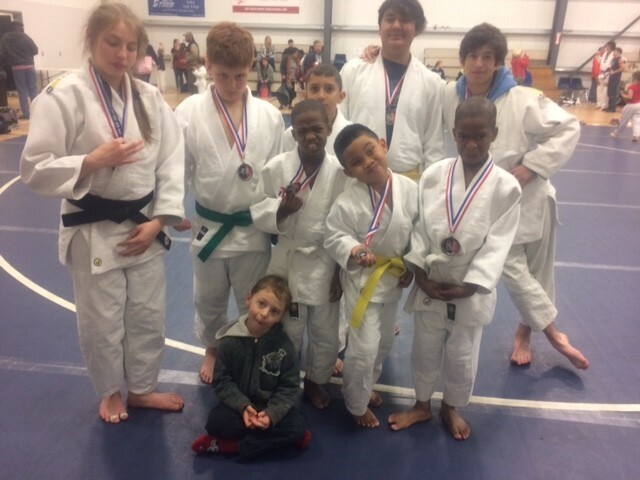 We had a great time at the Continental Judo Crown hanging out with the Black Bear Judo Club. 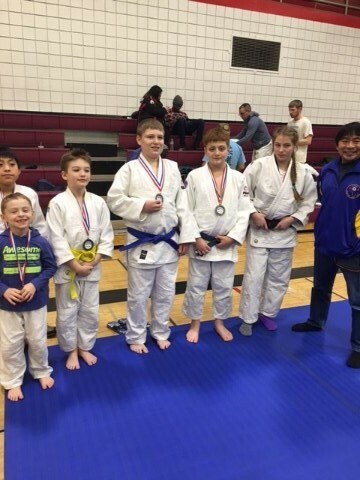 Click here to see MVJ results and other Alaska Club results along with a couple of podium Pics. 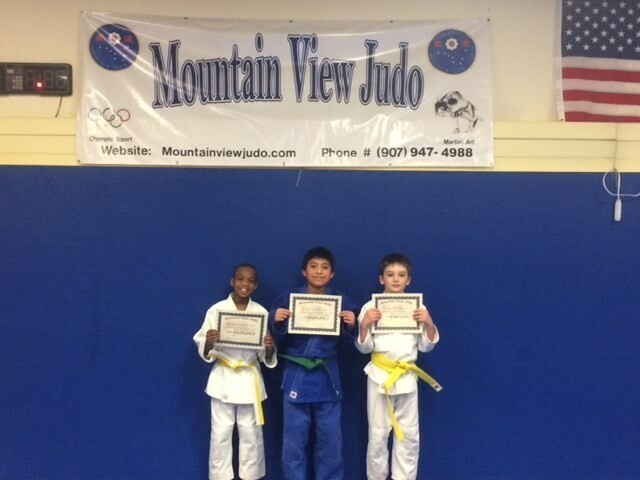 ​A big thanks to the parents for bring their Judoka to represent MVJ and also a big thanks to the MVJ coaches and referees that attended. 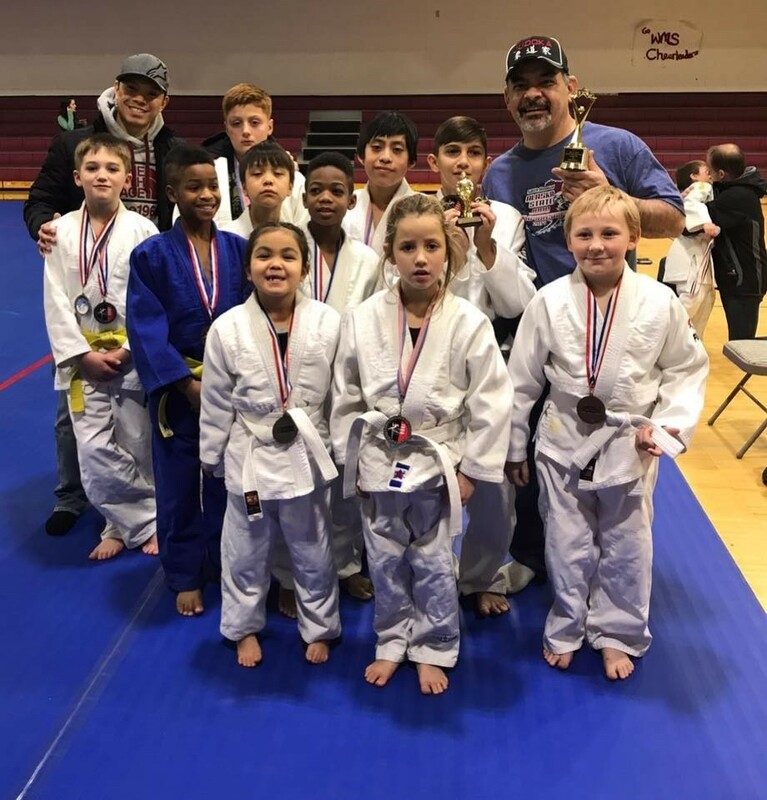 Saito Cup: The team took first place:7-8 Justice Reddish,9-10 Jace Miller,11-12 Landon Shooshanian,13-14 Garyn Kelso, 15-16 Dorian Mellon. 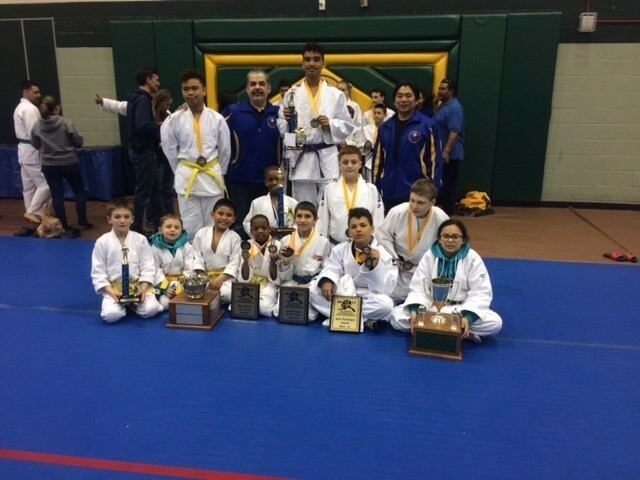 The team brought back The Alaska Judo Overall Team Points Champions Trophy. ​​​ Click here for rest of the results: results and pictures. 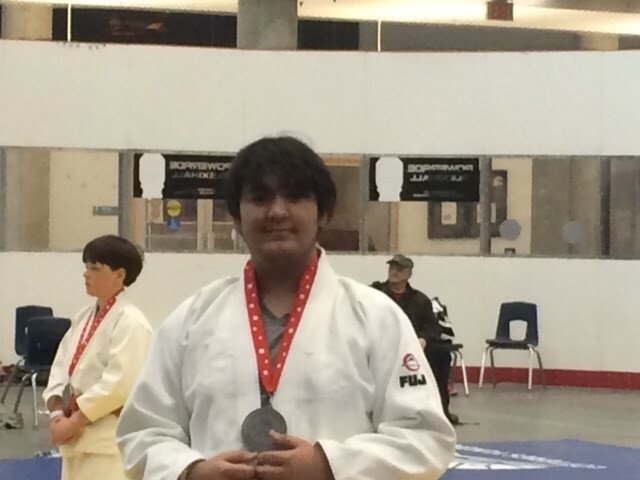 2017 Yukon Open MVJ results and pictures. Thank you all for coming out to the MVJ summer party. 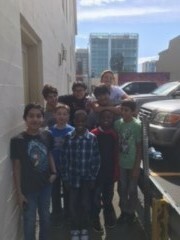 The party was at Lahn Pad Thai Restaurant at 302 G street. The food was great. and I hope everyone had a good time. I know I did. A big thanks to Gabby, Derek and Garyn for doing all the cooking. If you are in the mood for some Great Thai food please check them out down town or on Abbott Road. Club awards were handed out. Landon Shooshanian won Best Attendance and Top Competitor and Max Vaughn won Club Obi award. We presented Sensei Muraoka with a going away give gift from the club. A Gold Pan with our Logo printed on the inside. Sensei Muraoka made up a bunch of candy gift bags for the kids and also provide the adults with Japanese Whisky. Thank you very much. Our entertainment was via Karaoke. It took a little bit to get the ball rolling, but thank to Gabby and Talia going first, many more followed for our enjoyment and it ended with Sensei Muraoka finishing it off with a nice Japanese song. 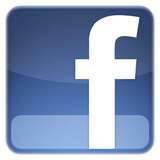 Click here for a Picture Slide Show. 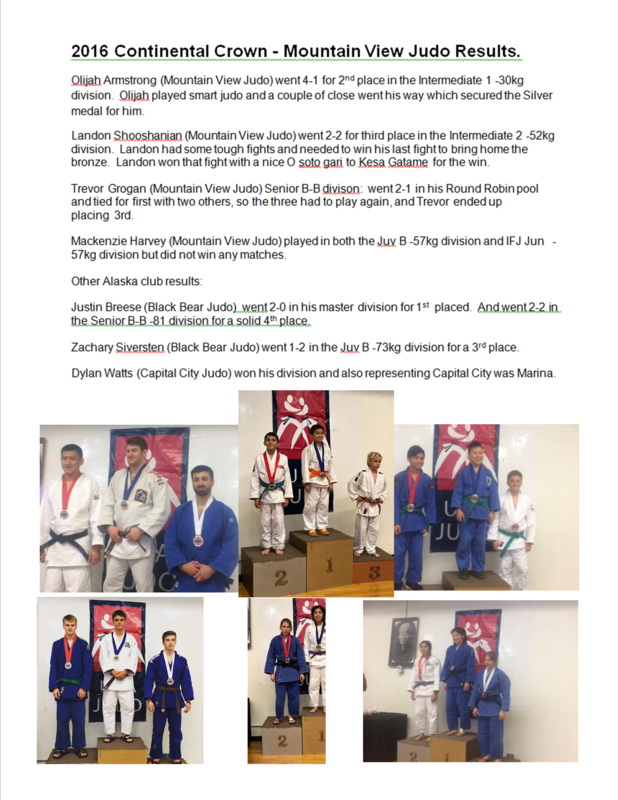 Nov 5th 2017 - Continental Judo Crown, Seattle WA, MVJ results. 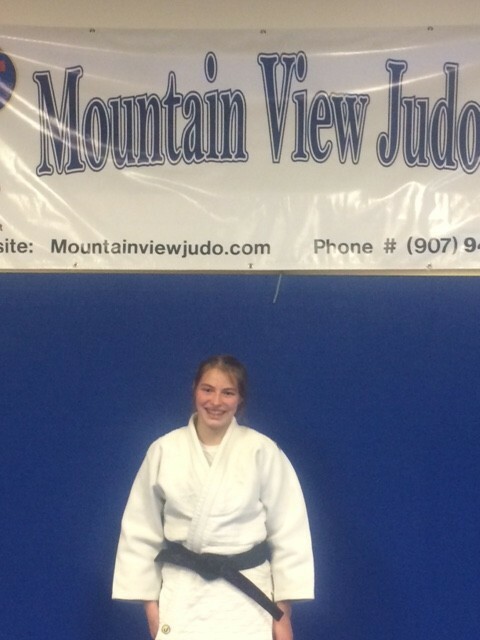 Jace Miller - MVJ Shiai Obi award. 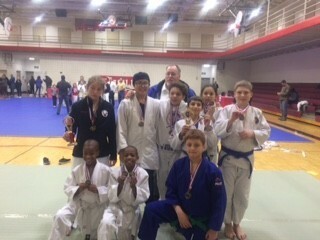 The team fought well and Tino did a great job coaching them. Thanks coach. After the tournament we all went to our traditional ​​​​​after tournament dinner at the Roaster BBQ joint and had some fine food and laughs. Fellow Alaskans Jacob Dempsey and Justin Breese also came along. ​​​​The design Olijah has in his hair is Alaska Judo initials. Very cool !!!! 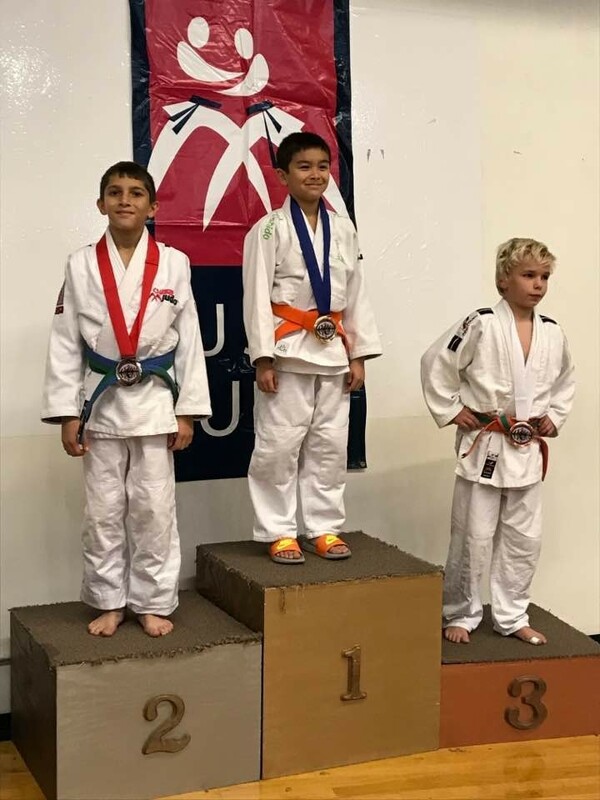 Jace Miller, Landon Shooshanian and Gavin Mellon take Gold at Alaska State No Gi BJJ Championships. 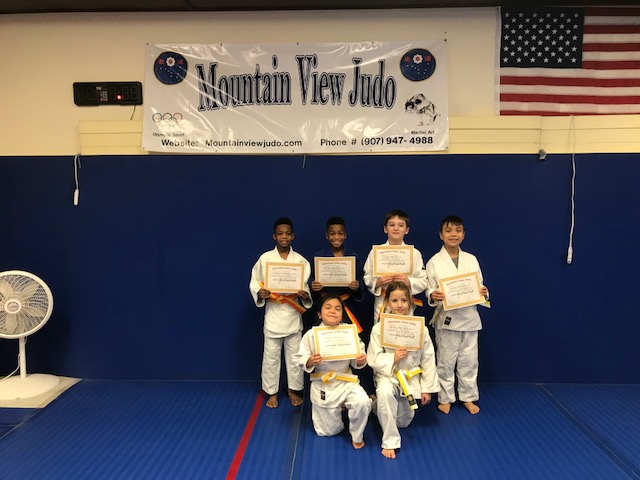 MVJ 's new young Judoka perform well at recent MATSU Nov 18th Shiai. Coach Tino says the whole team did very well and that Jace and Olijah stole the show. Click here for results and some podium pics courtesy of Harold. 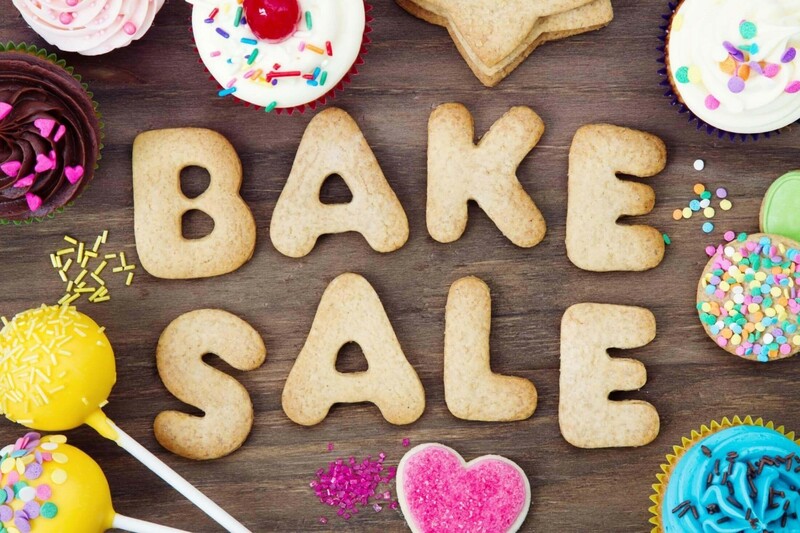 The Bake sale was a hugh success. A big thanks to all that donate food, put the event together and worked at the table. Also to all the people that bought the items. NOTE: the extra food was donated to Bean's Cafe. The MVJ Christmas Party was a great event. The Vaughn's sure know how to throw a party. Thank you very much for allowing us to invade your home.